For a painter who has so successfully neutralized the declarative potential of his medium, Gerhard Richter has committed to print a surprisingly large amount of discussion on his work. Perhaps it is only natural that an artist whose painting incarnates the Cagean premise that there is nothing to communicate should be moved to address that fact over and over. For this reason, the first edition of Richter's writings, The Daily Practice of Painting (published in 1993 by MIT Press) was an especially compelling collection, gathering the speculations of an artist profoundly involved in states of doubt, uncertainty and negation. Edited by Hans Ulrich Obrist, it quickly became a basic text in all of the creative fields. 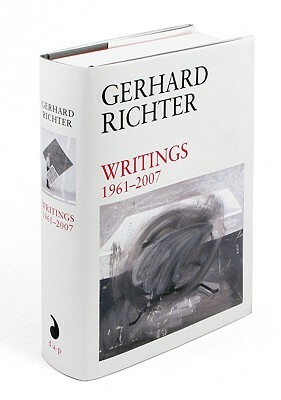 For this new, complete edition of the writings, Richter has placed his private archive at the editor's disposal; most of the photographic material comes from this archive and has not been previously published. The volume begins with the artist's farewell letters to his teacher Heinz Lohmar in 1961, is augmented with 15 unpublished texts from 1962 to 1993, as well as texts from the past 14 (highly productive) years of his career, and closes with an interview on his contribution to the 52nd Venice Biennale in 2007. In between are public statements on specific exhibitions, private reflections drawn from personal correspondence, answers to questions posed by critics and journal excerpts discussing the intentions, methods and subjects of his works from various periods. At more than 600 pages (the first edition was only 288), it is without doubt the essential companion to Richter's colossal oeuvre. Gerhard Richter was born in Dresden in 1932. His first solo show was in 1964 at Galerie Schmela in D sseldorf. Today he is ranked among the world's greatest painters.